Superior flame visuals dance amongst a strikingly realistic fuel bed of true-to-life, hand detailed logs. 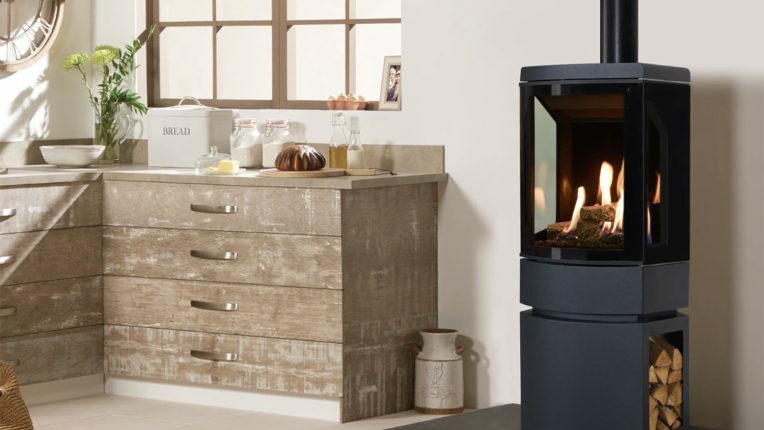 The interior of the stove features Gazco’s EchoFlame polished black glass lining, which multiplies the display on all sides for enhanced depth and wider viewing angles. The Loft’s ultra-modern style sees the combination of a glass and steel for the exterior, with a curved glass front and tapered sides. Burning at up to 94.3% efficiency this gas stove is an exceptional heating choice for your home and can be ignited, controlled and programmed to suit your lifestyle – all from the comfort of the sofa thanks to the Loft’s powerful programmable thermostatic remote control.